When given the choice to select a MenuJoy gift certificate we chose Mike's, an old favorite in Fairhaven. I've been going to Mike's since early in my marriage, and I've been married almost 37 years. It was good then and it's still terrific now. We pulled into the parking lot at 1:40 p.m. and were surprised to find it quite busy. There seemed to be a lot of tourists about, enjoying the local sites while on their way to the Cape. As we entered we noticed that some redecorating had been done since our last visit. The place looked bright, fresh and perked up. It was very attractive. We were immediately seated and approached by our waitress Nicole who gave us menus and took our drink order – two Diet Cokes. As we perused the large menu I was reminded again that Mike's fries nothing. There are no French fries or fried fish and chips. I think this is one of the few places I've been to that didn't serve fries, but I guess Mike's wants to keep us healthy. On this trip I noticed something else – no hamburgers. Although many sandwich choices are offered, there wasn't a burger in sight or on the menu. 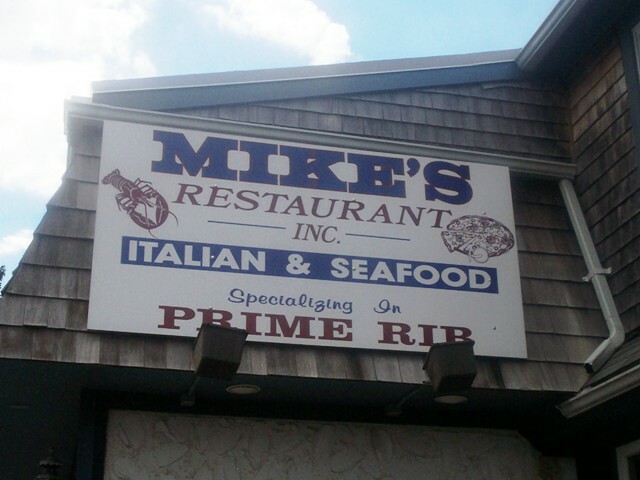 I was surprised, but not to fear, Mike's menu is extensive. Appetizers include shrimp cocktail, clams casino and king crab legs. They have soups and salads. You can get pasta many ways and delicious Italian dishes like lobster ravioli, veal parmesan and lasagna. There are several beef and chicken dishes including prime rib, filet mignon and blue cheese sirloin. Seafood dishes are numerous and include swordfish, shrimp, scallops and several preparations of lobster. If you can't decide, get one of their many surf 'n turfs and have the best of both worlds. 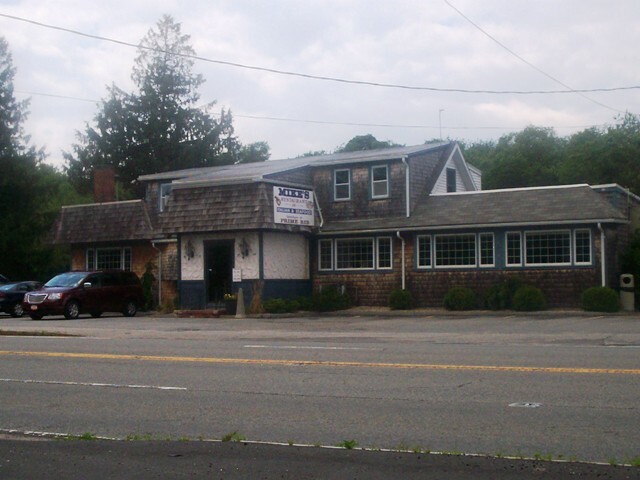 Mike's is also renowned for being a great pizza place. You can concoct your own or try one of their specialties such as Mike's Original, veggie lovers, New England clam boil or Philly cheese steak. Just want a quick bite? Get one of Mike's eight inch subs. They have meatball, Italian sausage, linguica and many more. There's even a kids’ menu, lunch specials, desserts, and everything is available for take-out. Click onto their website above for all their menu options. They are numerous. Nicole returned with our Diet Cokes and took our order. Laura decided to get the Mike's Original “Special” pizza. It consisted of linguica (a spicy Portuguese sausage), pepperoni, onions, peppers and mushrooms. She added black olives for an extra 99 cents. Laura's had this pizza before and absolutely loved it. I decided on the meatball sub which can be served closed or open-faced and smothered in meat sauce. I chose closed. My sub would be accompanied by a small bag of Lay’s potato chips (remember, no fries). It didn't take long for our food to arrive and you could tell it was freshly made and nicely hot. We dug right in. Laura's pizza was as great as she remembered. 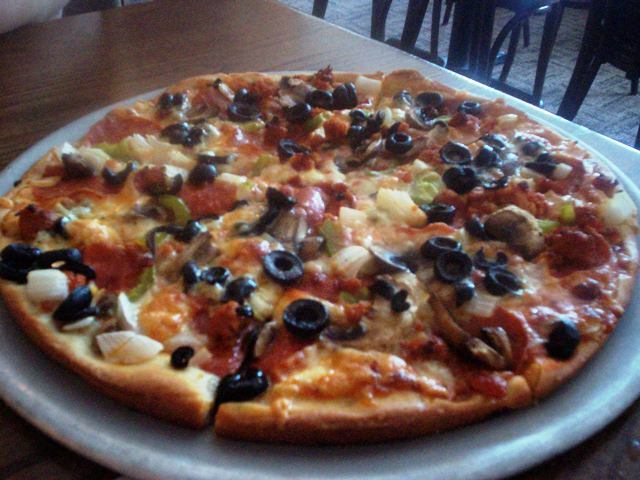 A thin crust “bar pie”, she likes it so much that it's hard getting her to try anything else. My meatball sandwich was also terrific. 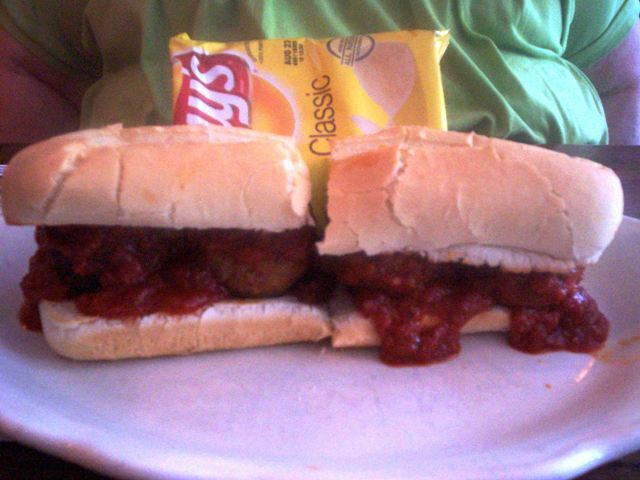 The sub roll was soft and fresh, the meatballs were large and very meaty and the sauce was thick and robust. I loved this sandwich because it was so tasty. I would get it again in a minute. I even liked the little bag of fresh Lay's chips. This was a great lunch. We left $24 for Nicole, which included a 20% tip. Since we had a $10 certificate from MenuJoy.com, we only paid $14. Oh happy day! We love Mike's. The restaurant is pleasant, the service is good and the food is always delicious. Plus the prices aren't bad at all, as you'll see in our summary. We even checked out the ladies' room before we left and found it pretty and clean. Our one complaint is that the booths are pushed very close together and can be a little tight and a bit uncomfortable. But hey, maybe that's just us, lol! Go to Mike's. I'm sure it will become one of your favorite places as it is ours. 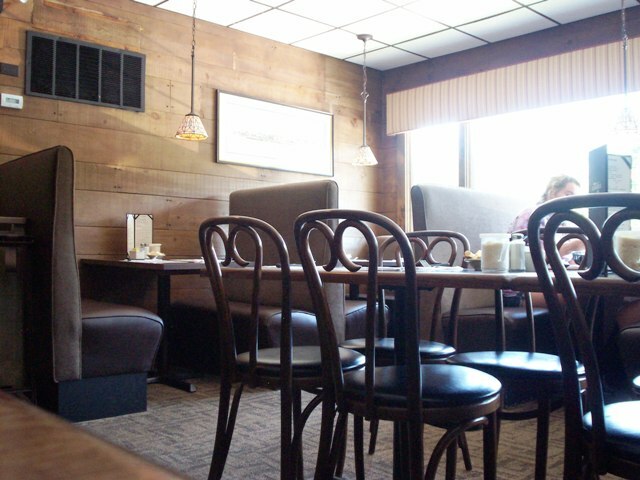 Mike’s Restaurant is open from 11:30 a.m. to 10 p.m. Monday through Thursday (fall and winter until 9 p.m.), 11:30 a.m. to 11 p.m. Friday and Saturday (fall and winter until 10:30 p.m.), and 12-10 p.m. Sunday and holidays (fall and winter until 9 p.m.). Check out our friends at MenuJoy.com for great area restaurants. PS - We had a celebrity sighting! Does anyone remember Tony, Danny's "talking" finger from the film The Shining? 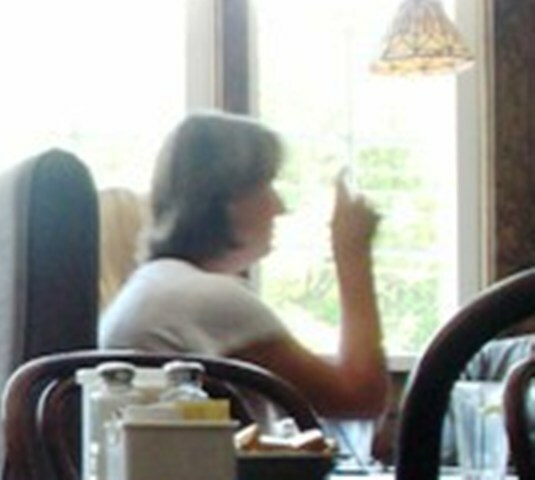 Well, apparently the "little boy who lives in Danny's mouth" is now hanging out with some woman in a booth at Mike's.